How fallible was the eye, that essential part of an astronomer’s equipment? The days when astronomers peered through telescopes at the planets of the solar system, straining for hours through Earth’s trembling atmosphere in the hope of glimpsing some revealing detail, are long past. The invention of photography could not help them, as the inevitable necessity for time exposures blurred out all fine features. Theirs was a romantic era of speculation and mystery, with an occasional solid fact. Was that elusive haze on Venus a planetary storm, a mountain range, or eyestrain? Would there be a few instants of good 'seeing' when details on the edge of visibility would flash suddenly into clear view before veiling themselves again? Now their efforts are often forgotten, or treated with disdain. Yet they did discover the essential natures of those planets, and during their vigils saw some remarkable sights. Imagine living on a planet where the Sun blazes in the skies with a disk four and a half times larger than that which we see from the Earth..It is not likely that there are any inhabitants on such a Mercury. The two 'inferior' planets (closer to the Sun than the Earth) proved a disappointment when viewed through the telescope. Mercury, the closest planet to the Sun, was especially elusive, and provided little reward to astronomers when finally tracked down. The planet is only slightly larger than our Moon, but 200 times further away. It can only be seen for a few weeks when not in the vicinity of the Sun. A large telescope with a magnification of at least x200 is needed to show it at the same size as the Moon seen with the naked eye. Sometimes, the planet did deign to reveal a few of its secrets, usually in the form of vague 'dark areas' or 'light areas'. The German astronomer Johann Schroter, about the year 1800, described dark bands which he thought marked an 'equatorial zone', and was confident enough to produce the first map of the planet, and to estimate its rotation-period, which he said was 24 hours and 5 minutes. Schiaparelli, despite his comments on the lack of results, saw dark streaks and patches, and also drew a a more detailed chart. His repeated observations always seemed to show the same features, and from this he concluded that Mercury's day was the same as its year (88 terrestrial days) and that it always kept the same face to the Sun. E. M. Antoniadi, with the 33-inch refractor at Meudon Observatory, produced a map and gave names to the dark and light areas. Unfortunately all his names, including the magnificent Solitudo Hermae Trismegisti (Wilderness of Mercury the Thrice Greatest) were discarded with the advent of the space age. Occasionally Mercury's features, already vague, became even more obscure. Schiaparelli and Antoniadi said that the dark markings 'were often veiled by whitish clouds'. Antoniadi even claimed that these clouds were 'more frequent and obliterating than those of Mars.' Other astronomers disagreed and said that they had never seen anything remotely resembling a cloud. Like almost everything about Mercury, apart from the fact that it was a sphere, there was always opportunity for dispute. Like the second inferior planet Venus, Mercury sometimes passes across the face of the Sun in a transit. Following a prediction by Kepler, Pierre Gassendi was the first to observe a transit of Mercury, on November 7th, 1681. He prepared to observe the transit by means of a pinhole in his darkened room which projected an image of the Sun. He began two days earlier than the time predicted by Kepler. The first day was wet, the second was overcast, and so was the third, until just before 8 a.m., when the clouds began to break. By 9 a.m. the sky was clear. Gassendi saw a black spot on the Sun, but doubted it was Mercury because of its 'extreme smallness'. However, measurements showed motion, and confirmed the planet. Something odd was seen during the transit of May 7th, 1799. The round black disc of Mercury seemed to be surrounded by a dimly luminous aureole or 'nebulous ring'. At subsequent transits the aureole was often seen again, sometimes as a 'dusky tinge' or a 'bright ring'. Once more, controversy raged. Was the ring visible proof that Mercury had a deep extensive atmosphere, or was it an illusion created by contrast? Few astronomers would have agreed with the optimistic Willam Peck in 1890, who said that “Mercury has an extensive atmosphere with large quantities of water vapour, indicating the presence of oceans...it is not improbable that some form of life exists there.” Edwin Dunkin commented discouragingly on the subject of Mercury's transit annulus a year later, that “many (observers)...with large telescopes have been unable to perceive anything peculiar”. What were conditions like on Mercury? There was little enough solid data to work on. The could be no doubt, at least, that the planet was hot. Schiaparelli's conclusion that Mercury always kept one face towards the Sun seemed to be confirmed by the observations of Lyon, Dollfus and others. Therefore, while the day side of the planet must be subjected to an 'appalling scorching', the night side, which never saw the Sun, must be bitterly cold. In fact, Mercury must be both the hottest and coldest planet in the solar system. This fact was a staple of astronomy textbooks and science fiction stories until the 1960s. Then, radar observations showed that Mercury has a rotation-period of almost 59 days. Nonetheless, the old observers were not mistaken when they claimed to see the same markings on the planet in repeated observations. Because of several curious features in Mercury's orbit, when the circumstances for observation are the same, the regions of the planet exposed to Earthly view are also the same. Haec immatura a me iam frustra leguntur: o. y.
Venus, the second planet from the Sun, and the most brilliant as seen with the naked eye, proved to be even more disappointing than Mercury when viewed telescopically. Galileo discovered that the planet showed phases, from crescent to gibbous, but thereafter observers scrutinised the Planet of Love for hundreds of years without seeing anything much more definite. In 1643 Fontana recorded 'dusky shadings', and these, together with occasional 'bright patches', were really all there was to be seen on most occasions. The Italian astronomer F. Bianchini, between 1727 and 1732, did his best with the 'dusky shadings', and drew a map of Venus showing mountains and continents. In August of 1700, Phillipe la Hire, observing the planet during the day, recorded “greater inequalities in the termination of light on Venus, than on the Moon”, which were believed to indicate higher mountains. In 1789 Johann Hieronymus Schroter, who had been assiduously observing Venus for ten years, believed he had seen such a mountain. On December 28th, using a 7-foot Herschelian telescope, he saw that, while the planet's northern cusp appeared pointed, as it should, the southern appeared blunt, and also showed something strange. Upon Venus' night side, a short distance from the terminator, there appeared a 'luminous speck'. Schroter saw the blunted cusp and the mysterious speck again on January 1st, 1790, and December 25th, 1791. He believed that the speck was an 'enlightened mountain', a peak so high that it still caught the Sun's rays after night had fallen on that region of the planet. In fact, according to Schroter's measurements, the mountain must have been almost 22 miles high. Many found this deduction difficult to accept. Some pointed out that a mountain of such dimensions, on a planet the size of the Earth, would collapse under its own weight. William Herschel failed to see any mountains, or indeed anything on Venus except the usual 'dusky spots'. Bianchini’s chart of Venus, 1727, made after two years’ observations. Eventually it was conceded that Venus must be swathed in a dense cloudy atmosphere, and any phenomena observed on that planet were evanescent. The 'polar hoods' or 'cusp caps' were an example. These were bright patches on the north and south horns of Venus, and it seemed reasonable to believe that the 'cusp caps' actually marked the north and south poles, although where the poles actually were was unknown. However, if Venus' surface was concealed by cloud, the caps could not actually be snow and ice. Or could they? The mountains of Venus would not lie down. 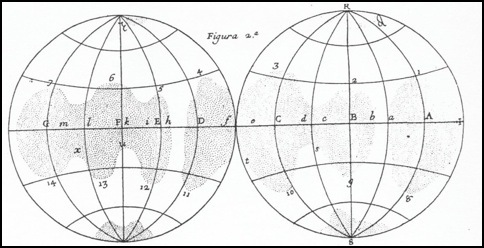 On February 5th, 1878, Etienne Trouvelot, observing the southern cap, saw that it seemed to be composed of 'a confused mass of luminous points', which resembled 'a mountainous district studded with numerous peaks'. The bright points did not move, and surely must be the peaks of mountains rising above Venus' clouds. 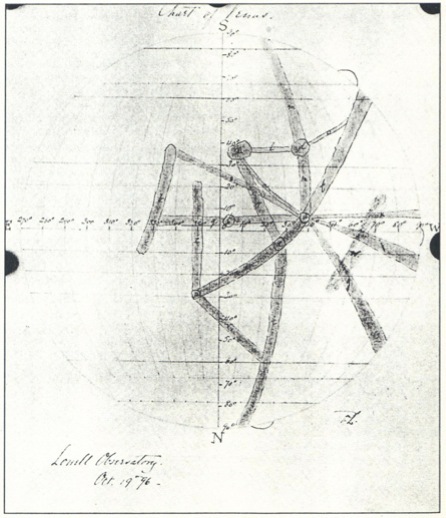 Percival Lowell’s chart of Venus, 1896. 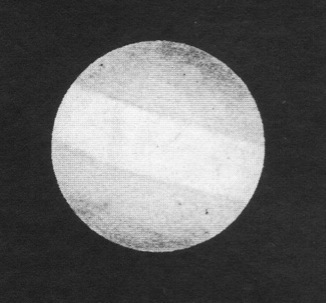 From June 7th, 1721, when C. Kirch saw the night side of Venus 'faintly shining', to the present day, many observers have reported the Ashen Light. 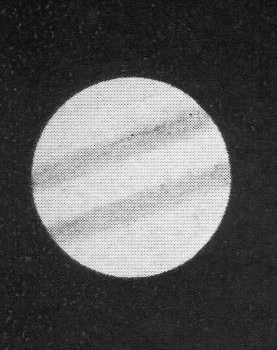 On February 10th, 1822, J. W. Pastorff saw the planet's night side shining with a faint grey light, in which he could make out brighter and darker areas. It was generally conceded that the Ashen Light was a real effect, but what its origin might be remained unknown. There was no lack of theories, ranging from phosphorescent seas or a luminous atmosphere, to forests set ablaze during 'general religious festivals of the inhabitants of Venus'. Some astronomers thought that the Earth might illuminate Venus' dark side as it did our Moon's, until calculations showed that Earthlight on Venus would only equal that of a 14th-magnitude star. Johann Schroter suggested that the Ashen Light was a planet-wide aurora, and this remained the most popular theory. A few observers, weary of Venus' perpetual overcast, persisted in their search for a glimpse of the actual body of the planet. 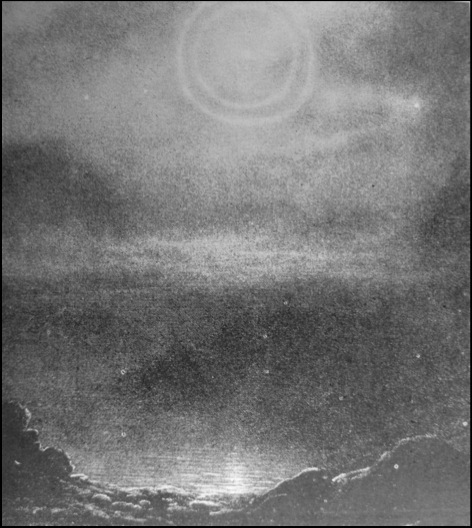 During February of 1913 a 'definite indentation' was seen on Venus' terminator, and some thought it might indicate a peak 40 miles high, excelling even Schroter's 'enlightened mountain'; others considered the possibility of a huge volcanic explosion. 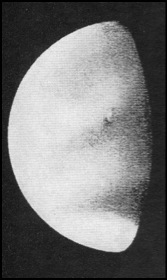 At the end of the 19th Century, both Leo Brenner and Percival Lowell claimed to have seen surface features on Venus. 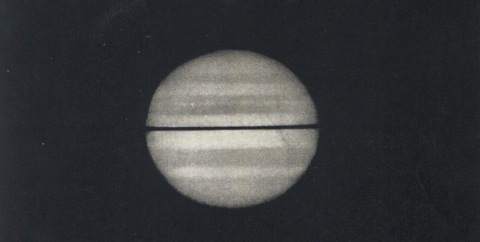 Brenner thought he had caught glimpses of oceans through gaps in Venus' clouds, drawing them as dark features which were vaguely symmetrical about the equator. Lowell, who was almost alone in rejecting the idea of a dense atmosphere about Venus, said he saw sharply defined linear features on the planet, radiating spoke-like from a dark central spot. He had covered the surface of Mars with linear 'canals', which he believed were the work of sentient Martians; but his markings on Venus were, he claimed, natural, having the appearance of 'barren ground or rock'. In the 1940s, Dollfus, while accepting a dense atmosphere, thought that certain faint markings were surface features glimpsed through the thick clouds. They were only seen occasionally, but persevering study showed a pattern that was 'vaguely radial'. Despite Venus' reluctance to reveal her secrets, the planet did seem to be a possible second Earth. It was, after all, almost the same size, and had an atmosphere, with clouds. William Peck, ever hopeful, remarked, “Oceans and continents are...there, and very probably inhabitants. In fact, at present, VENUS is probably the only inhabited planet in the solar system besides our earth.” Other astronomers had to confess that they knew very little about the planet. 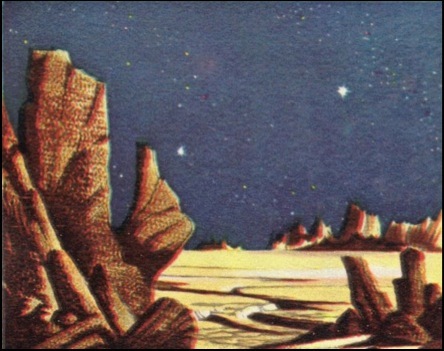 In 1948, Willy Ley said, “We know less about Venus than we do about Mercury”, and ten years later, R. A. Gallant was obliged to confess that, “since Galileo's time the lovely Venus has remained pretty much of a mystery planet.” Even the planet's rotation-period was unknown, although there had been many attempts to discover at least this. In 1666, the French astronomer J.D. Cassini said that Venus rotated in 23 days. A year later he revised this to 23 hours. About 1732, Bianchini, who believed he was seeing a solid surface, came up with a period of 24 days 7 hours 54 minutes. Others decided that Venus, like Mercury, had one side always facing the Sun. Speculation abounded, from Venus as a dry red desert 'heated to...boiling point' to oceans of petroleum or carbonated water. Although W. S. Adams and T. Dunham had detected carbon dioxide in Venus' atmosphere in 1932, some optimists still hoped that the planet might harbour at least primitive life-forms. However, the general opinion was that the Planet of Love was a hot, windy cloud-enshrouded desert. Visiting spacecraft resolved some of these mysteries. Venus was hot, swathed in sulphurous clouds, with a surface temperature of nearly 500 degrees Centigrade. Venus rotates in 243 days, a period longer than its year. The old observers were sometimes vindicated. The Russian Veneras in 1976 detected an aurora-like 'airglow' on the night side, sometimes 'strong enough to be seen by visual observers on Earth'. There are 'polar hoods', in the form of a canopy of high cirrus clouds, which do mark the actual poles. A probe orbiting the planet in 1979 recorded X-shaped and Y-shaped cloud patterns, detected in ultraviolet but faintly seen in visible light, which may account for the 'linear features' and 'spokes'. Even the 22-mile and 40-mile high enlightened mountains may be mountainous clouds. There should have been a planet between Mars and Jupiter, according to a mathematical law formulated in 1772. 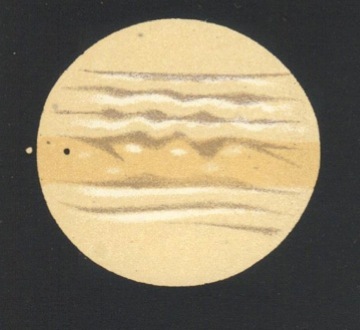 Astronomers set themselves the task of finding this mystery planet, and on the first day of the 19th century, the Sicilian Giuseppi Piazzi found it, by accident. Piazzi was compiling a star catalogue. Every clear night, he measured the positions of 50 stars, repeating the process on several nights until he had 3 or 4 positions for each star. When these 50 stars had been pinned down, Piazzi repeated the process with the next 50 stars. He did this for 159 nights. On January 1st, 1801, 50 more stars were measured. All looked like stars, including star no. 13, an 8th-magnitude object in the constellation Taurus. On the next night, the measurements began again; but now there was a difference. Star no. 13 had moved. Measurements on following nights confirmed the movement. The unknown planet had been found. The solar system's latest member was named Ceres. Yet there was something odd about it. For one thing, it was absurdly small. Estimates of Ceres' diameter ranged from 160 miles to 450 miles, but whichever estimate was accepted, it was surely too small to be a self-respecting planet. The search continued. During the next six years, three more asteroids were discovered; Pallas, Juno, and Vesta. All were tiny, no more than a few hundred miles in diameter. Something strange had evidently been going on in the space between Mars and Jupiter. Theories involving an exploded planet began to circulate. Observers did their best with these minute bodies. Schroter thought that Ceres and Pallas had a 'vaporous appearance', which he believed was evidence of an atmosphere 500 miles deep. Later, the 'atmosphere' was judged to be due to imperfections in his telescope. Meanwhile, there was a lull on the asteroid front for 23 years, until 1830, when the Prussian amateur astronomer Hencke, after 15 years' searching, discovered Astraea. Thereafter, asteroids came thick and fast. By 1870, 109 had been discovered, even though the search for these bodies always required patience and dedication. By 1891, when Max Wolff instituted photographic searches, the number of asteroids had risen to 300. Soon it would be accepted that there must be thousands of them. Most asteroids circulated sedately between Mars and Jupiter, but there were exceptions. Some had eccentric orbits, taking them close to the Sun or out into the far reaches of the solar system, and a few came close to Earth – 'close' being a relative term when expressed in astronomical distances. On August 13, 1898, G. Witt in Berlin discovered the object first known as 1898DQ, later named Eros, as it came within 16 million miles of the Earth. 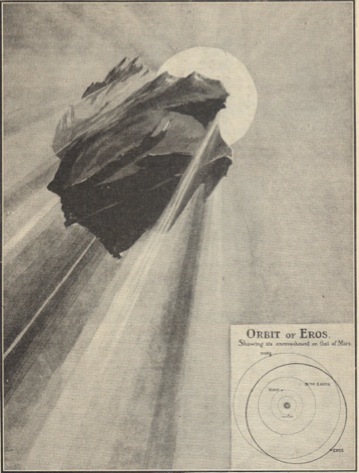 In 1900, as Eros approached to within 30 million miles of our planet, it displayed variations in brightness with a period of two an a half hours. Suggestions were made that Eros was actually two bodies revolving closely about each other, or perhaps actually touching. On January 30th, 1931, Eros passed within 17 million miles of the Earth. It was judged to be a cylinder 15 miles long and 4 miles wide. 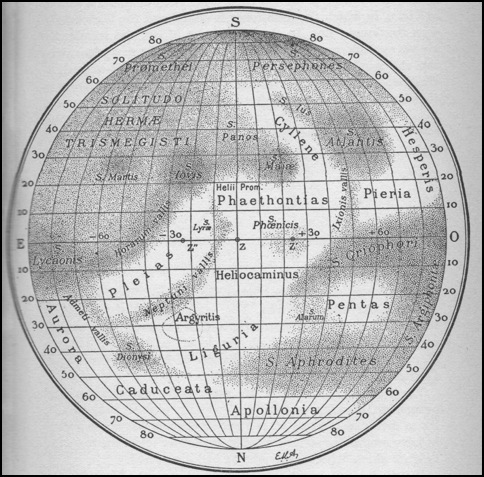 One astronomer reported seeing Eros as 'oval', and others watched it changing shape as it rotated. Eros passed the Earth at a respectful distance, but other asteroids ventured closer. In 1932, Apollo came within 7 million miles, and in 1936 Adonis closed to somewhat over a million miles. A year later, on October 30th, 1937, the mile-wide 'Object Reinmuth', or Hermes, passed within 485,000 miles at a speed of 20 miles a second.. 'World Disaster Missed by Five Hours' claimed some newspapers, but astronomers remained calm. The whereabouts of Hermes is at present unknown. Jupiter is, so far as we can see, not a solid body. The fifth planet of the solar system was a different proposition from the small bodies closer to the Sun, Mercury, Venus, and Mars, that astronomers strained their telescopes over. For one thing, it was easier to see; and it was huge. Its vast globe showed, not the fugitive hazes of the inferior planets, or the vague markings on the tiny image of Mars, but, in a large telescope, a sometimes overwhelming mass of detail. Even Galileo's first telescope showed the planet's disc and moons, and Christiaan Huygens, about 1650, observed belts. In 1665 Giovanni Cassini was able to measure Jupiter's rotation-period. It was realised that the surface of Jupiter, like that of Venus, must be concealed beneath a thick cloudy atmosphere, although some observers thought that the planet might actually be self-luminous. However, the facts that Jupiter sometimes shows a slight gibbous phase and the satellites vanish when in the planet's shadow demonstrated that this could not be so. 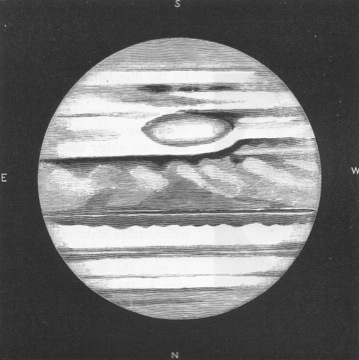 Jupiter's atmosphere, unlike Venus', did not frustrate astronomers, as it held enough features to keep them busy. The belt zones were named, and considered semi-permanent, although occasionally one faded or even vanished. In 1834 a large dark northern belt disappeared, and in 1869 – 70 the equatorial belt changed colour from white to yellowish-red. The colours on Jupiter were sometimes remarkable. Reds, browns, and pinks were seen, with rich colours in the belt zones. Over the years, the Jovian colours seemed to fade, and by 1954, Patrick Moore was of the opinion that 'no colours are conspicuous'. The king of spots was the Great Red Spot. Indications of this object appear on drawings made by Robert Hooke and Cassini in 1664 and 1665. In 1831 it showed itself as a hollow among the belts. Then, in 1878, it appeared as a dark, brick-red, oval apparition 30,000 miles long and 7,000 miles wide. In 1882 the Spot began to fade, until by 1890 it was again only visible as a hollow. It fluctuated thereafter, becoming prominent again in 1938 and 1960. The Spot also moved. By 1948 it had moved from its original position a distance of one-quarter of the diameter of Jupiter. But what was it? One suggestion was that an asteroid had crashed on Jupiter, “causing a lava flow covering half a million square miles”. Another was that the Spot was solid, a floating island of tinted ice which rose and fell amid the clouds; or perhaps a volcanic eruption. Many astronomers believed that Jupiter was a hot planet, with a 'red-hot fiery nucleus' thousands of miles below the clouds, and the Spot was this surface revealed by a brief clearing. As well as a fine retinue of satellites, there was slight evidence that Jupiter might be encircled by a ring. 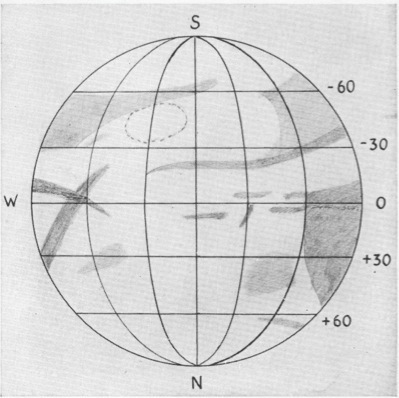 In 1964, a study of numerous drawings of the planet by the Ukranian astronomer S. Vsekhsvyatsky indicated a thin streak in the equatorial region, which was possibly a ring. Fifteen years later, in 1979, the space probe Voyager 1 detected a tenuous Jovian ring, 80, 000 kilometres wide. It also discovered that the Great Red Spot is a gigantic vortex, and the remarkable moon Io is encrusted with sulphur-spewing volcanoes. As Saturn swims into view, cold, remote, lonely and unutterably magnificent, it makes a picture which no-one who has seen it will ever be likely to forget. 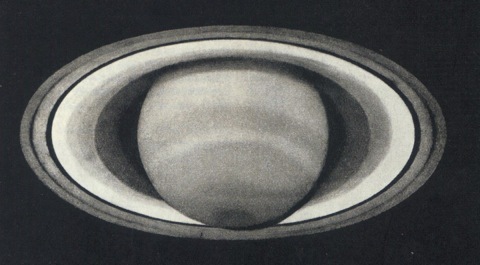 The planet Saturn, an unremarkable star to the naked eye, was a sore puzzle to Galileo, the first telescopic astronomer. With a small instrument, the planet seemed elongated into an ellipse. To a more powerful telescope, magnifying over 30 times, Saturn appeared a triple planet. Two bodies escorted the central globe, almost touching it on each side. “They are like two supporters, who help old Saturn on his way, and always remain at his side”, Galileo said. Later, the two satellites disappeared, only to return later. It needed more sophisticated telescopes to penetrate the mystery. 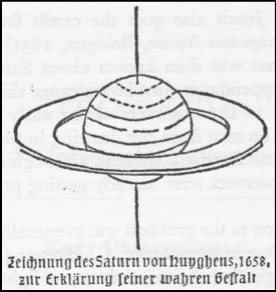 In 1659, Christiaan Huygens announced that Saturn was surrounded by “a flat ring, which nowhere touches the body of the planet”. 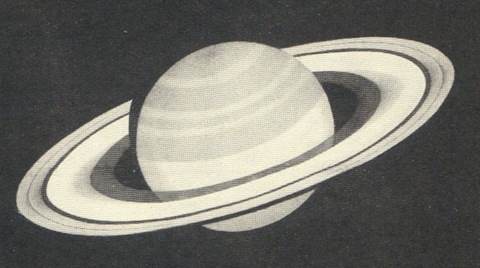 Saturn's rings turned out to be the spectacle of the solar system, and the globe of the planet tended to be neglected. Saturn seemed to be Jupiter on a smaller scale, with belts and spots, although less well-defined. In 1794 Sir William Herschel saw a white spot near Saturn's equator, which rotated about the planet in 19 hours 16 minutes. 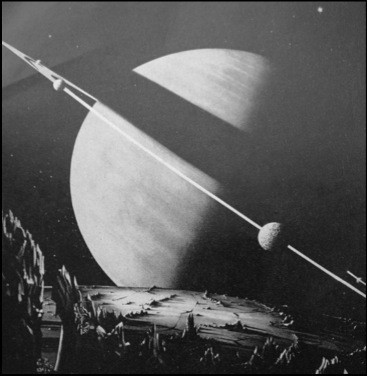 Saturn's most spectacular spot, which was also white, was discovered by Will Hay on August 3rd, 1933. By August 9th, it was 29,000 miles long and 8,000 miles wide, with a rotation-period of 10 hours 15 minutes. After a few months, the spot spread out and vanished. 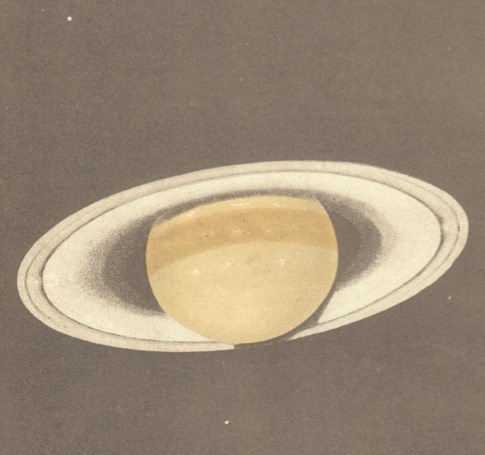 Saturn's ring, so alien to Earthly experience, was the cynosure of most telescopes. In 1675, J. D. Cassini discovered a dark gap in the centre of the ring; the 'Cassini Division'; so there was more than one ring. In 1850, W.C. Bond discovered the 'Dusky Ring' or 'Crepe Ring', a dark zone inside the main bright rings. Astronomers then wondered why William Herschel, a dedicated observer of Saturn, had never seen the Crepe Ring, or, if he had, never mentioned it. After 1850, the Ring was quite easily visible. Perhaps it had brightened up since Herschel's time? As usual, the issue remained unresolvable. Herschel did discover that Saturn's rings rotate. In 1789, the rings were edge-on as seen from Earth, and invisible in small telescopes. In Herschel's 20-foot reflector, the edge could be seen as a broken line of light. Spots of light on this line gradually moved from one end to the other, and from this Herschel determined the ring's rotation-period to be 10 hours 32 minutes 15 seconds. 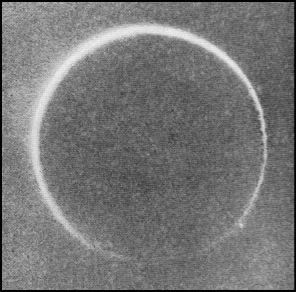 In 1907 and 1908, Bowyer, Lewis, and Eddington, using a 28-inch refractor at Greenwich, and straining their telescope to the utmost, thought they had detected another dusky ring, just outside the bright rings. On October 12th, Bowyer 'suspected' that part of the outer ring looked faintly fuzzy, but a day later, the 'new' ring was only visible in 'steady moments'. E.E. 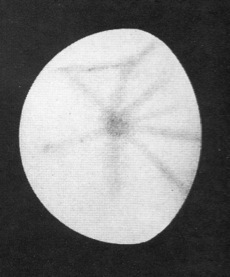 Barnard, using the huge Yerkes 40-inch refractor, could see no evidence of an exterior ring. In 1861, Otto Struve and Wray saw another curious apparition; “clouds of a less intense light, lying on the ring...supposed to be due to the satellites drawn out of the plane of the ring by the attraction of Saturn's outer satellite.” By now it was accepted that Saturn's rings could not be solid, or liquid. They must be composed of innumerable particles, literally 'satellites', orbiting around the planet. Saturn also had a retinue of more conventional satellites. On March 25th, 1655, Huygens observed a small star near the planet. On the next night there was no doubt that the 'star' was a moon of Saturn. It was named Titan, and turned out to be the second largest moon in the solar system (the largest being Jupiter's Ganymede). Titan was so large that it showed a disc, with vague markings, even at Saturnian distance, and in 1944 Kuiper detected methane. Titan had an atmosphere. G. D. Cassini discovered four more of Saturn's satellites between 1671 and 1684, using one of the remarkable 'air telescopes' invented in the 17th century. These had no tubes; the naked objective and eyepiece were mounted on an immensely long spar, so as to obtain high magnification while compensating for objective defects. Cassini's telescope was 100 feet long. Before visiting spacecraft, Saturn was thought to possess nine moons. A tenth, Themis, seen by Pickering in 1904, vanished, and has never been seen again. ...it appears that the new star...is a primary planet of our Solar System. Uranus had been seen many times before Herschel, by observers who missed their chance of fame by recording it as a star. Between 1690 and 1715, John Flamsteed noted it six times. 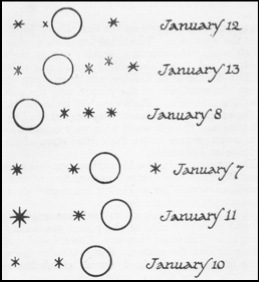 Between December 1768 and January 1769, Lemonnier recorded the planet as a different star 8 times, once on 4 consecutive nights. Unfortunately, a visible planetary disc was about that could be seen on Uranus for the next few hundred years. Occasional spots and belts were visible, or thought to be visible, but after the spectacle of Saturn, the “superb new planet was plunged into space to such a depth that, notwithstanding its noble proportions, it seemed merely a tiny star”. Herschel also discovered two of Uranus' moons, Oberon and Titania. In 1851, Lassell, with a 4-foot aperture reflector, found two more satellites, Ariel and Umbriel. These then went the same way as Saturn's mystery moon Themis, and for twenty years their existence was considered doubtful. They were tracked down again in 1873. Another fugitive phenomenon was Uranus' ring. On February 22nd, 1789, Herschel himself thought he had seen this. He wrote “a ring was suspected...The ring is short, not like that of Saturn...the two ansae seem of a colour a little inclined to red...I have not much doubt but that it (Uranus) has a ring”. Later he decided that the ring must have been a telescopic defect. On March 10th, 1977, 188 years later, a system of Uranian rings were discovered when the planet occulted a 9th-magnitude star. The past year...has given us the probable prospect of another (planet). Neptune, the forth giant gas planet of the solar system, was tracked down in 1846 by Urbain Le Verrier after subtle mathematical work involving the peturbations of Uranus. Then the problem remained of finding it. Le Verrier sent his calculations to Johann Galle and Heinrich d'Arrest at the Berlin Observatory. On September 23rd, 1846, they looked at the indicated region with a 9-inch refractor, and found an 8th-magnitude uncharted star very close to the predicted position. It was watched until it set in the early morning. The 'star' was suspected of showing a disc, but no-one was sure, and there was also doubt as to whether it had moved. The next night there was no doubt; the 'star' had moved, and was the unknown planet. 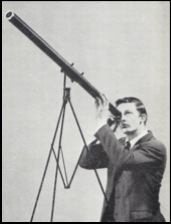 Meanwhile in England, James Challis was also searching the sky, following Le Verrier's calculations. Unfortunately, he was using a time-consuming method of plotting stars, then checking for movement. He saw Neptune on July 30th and August 4th, but failed to recognise it. On September 23rd, as Galle and d'Arrest were searching for Neptune, a young assistant at the Cambridge Observatory told Challis that he had seen a body showing a 'neat round disc' at the predicted position. Challis took time to drink his tea, and as he finished, the sky clouded over. A disc was more or less all that could be seen of Neptune. The planet did have “a bluish or leaden tint, perceptibly different from the sea-green of Uranus.” Sometimes a brightish equatorial zone could be made out with powerful telescopes. 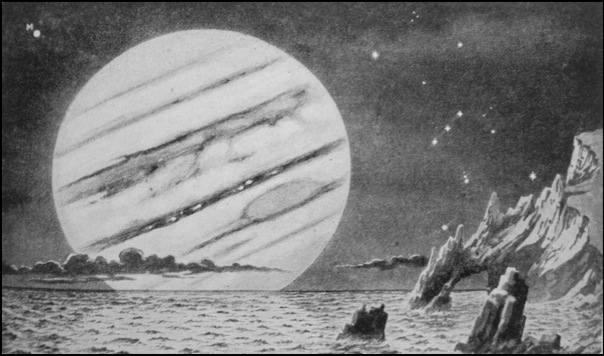 Two moons were discovered, Triton in 1846 and Nereid in 1949. A month after the planet's discovery, there was a brief stir over a possible Neptunian ring. On October 24th, W, Lassell, with a 24-inch reflector, observed Neptune 'to have apparently a very obliquely situated ring'. It seemed like Saturn as seen in a small telescope, 'but much fainter'. Later he decided that the whole thing was an optical illusion. 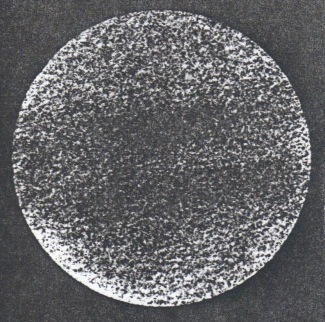 Pluto, discovered photographically by Clyde Tombaugh in 1930, seemed an odd object. It took its place as the solar system's outermost planet, but there were always doubts. Astronomers strove to find out something definite about Pluto, but the only certain knowledge was of its eccentric orbit, which sometimes took it inside the orbit of Neptune. In 1965, Werner Sander reported the theory of E. Madlow, that Pluto was in fact the first discovered member of another asteroid belt beyond the orbit of Neptune. In 2006, the International Astronomical Union demoted Pluto. It was no longer a planet, but an asteroid, a minor planet, a 'dwarf planet', or a 'plutoid'. The solar system was once again reduced to eight planets, with Neptune as the outermost. Pluto became just one of a swarm of trans-Neptunian objects.